A high-performance Coaxial and Ethernet cable cutting tool. Provides a smooth and even cut end which is essential to pre-termination cable preparation. Heavy duty precision low effort ratchet tool for professionals and amateurs who terminate co-axial cables and shielded modular plugs. An essential tool for installing compression Coax, RCA, and BNC compression typre connectors. 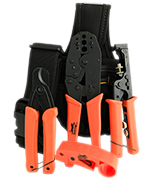 A high-performance coaxial stripper with strong ergonomic design! Performs three-level stripping of coaxial cables. Strips outer jacket, shield braid and inner dielectric. Great for Cat 5, Cat 6 and Fiber Optic cable! Insulated staples will not degrade performance. Quickly allows you to staple cable to ceilings, walls, or any other applicable suface. Works excellent with thicker types of cables such as Coax and Cat 6A Shielded Ethernet cables. Box of 300 staples. Used to terminate co-axial cables for CATV, Sattellite, or Antenna onto keystone wallplates and boxes. FlashLight PAL™ is your ultimate FlashLight Companion. It gives you light HANDS-FREE! Adjustable, one size fits all hat with embroidered QuickTreX™ Logo. This is a top quality Premium hat.